Create an easy pencil or pen holder by up-cycling the inner cardboard cores of packing tapes. This technique makes cylindrical containers which are both sturdy and durable. Click on the photos for detailed instructions & click on what you will need for the requirements list. Or follow the text for how to make a handmade paper pencil holder. a) Check that you have removed all of the sticky tape from your cardboard ring. Any remaining adhesive could seep through, staining the handmade paper and spoiling your work. b) Place a ring over the mount board and draw a circle around it with a pencil. Carefully cut around the circle. c) Place one ring on top of the other and place the mount board circle on top (photo 2). Make sure the mount board circle is dead centre. d) Place masking tape only on the outside of the pencil holder framework to hold it all together. Two long pieces of masking tape making a cross over the mount board circle are usually enough. Keep the masking tape about 2 cm from the rim (photo 3). There should be no masking tape on the inside. a) Prepare wallpaper paste following manufacturer’s instructions. b) Tear a few pieces of handmade paper. Don’t cut the paper, tear it. Torn handmade paper has feathered edges which are not only beautiful but help to stick the layers together. The size and shape of the paper is not that important but irregular shaped pieces are better than square pieces. c) Fill your washing up bowl with about 2 cm (¾ inch) of cold water (photo 4). d) Place a few pieces of torn paper in the water. Leave them in the water for a few seconds until they become wet. This should take less than a minute. e) Lift the wet paper out and place it against the inner side of the washing up bowl to drain, leaving a corner of the paper sticking up above the rim of the bowl (photo 5). This makes it easier to pick up the piece of paper in the next step. Leave a little bit of space between each piece otherwise they will stick together. Let the excess water drip for a minute or two. a) Brush some adhesive on the inside of the framework. Pick a piece of wet paper and place on the adhesive. Brush a little adhesive over it. Place the next piece of paper on the pencil holder overlapping the first piece. Apply more adhesive. Don’t use too much adhesive, otherwise the paper will take a long time to dry. You will soon figure out how much glue to use. b) Keep adding more pieces of paper. Repeat until you have covered the whole of the inside of the pencil holder (photo 6). Some pieces of paper should cover both the side walls and the mount board base to hold it all together. Use the brush to press the damp paper into the inside corners at the base of the pencil holder. Cover the rim as well. (If the masking tape is too close to the rim, peel it back a couple of cm, but don’t remove the masking tape yet. c) Once you have covered all the inside surface and the rim with handmade paper, do two more layers, so that you have three layers altogether. d) Let it dry overnight resting on its base. Dry it away from a source of heat (i.e. not on a radiator or sunny windowsill). e) The following day, carefully remove only one strip of the masking tape (photo 7) and stick pieces of handmade paper to areas of the outside of the holder that are free of masking tape. Don’t put paper over the remaining masking tape. f) Remove the other piece of masking tape and repeat the procedure. Work with the vessel upside down and make sure you put paper on the base, some pieces should cover the base and the walls to give strength to the vessel. Check that you have covered all the areas and there are no gaps (photo 8). Make three layers of paper as before. g) Dry your pencil holder. 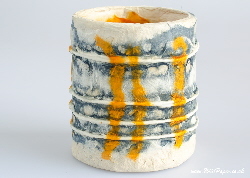 Before you start to decorate your paper vessel, cover a spare piece of mount board with handmade paper and experiment with different techniques and materials to see which one works best for you. It is also a good idea to create a mood board (photo 9, 10 & 11) with examples of work you like. You may like to visit our Pinterest boards for inspiration. a) An interesting way of really showing the beauty of the lokta paper is to tear off small pieces, glue the pieces down and then spread glue over the edges to show the fluffy feather-like edges. b) Make a mosaic using lokta craft papers over black lokta paper. c) Hemp or jute lokta papers work very well on their own. d) Create a watercolour effect with several colours of tissue paper. When using tissue paper, don’t soak it first. Dampen the background with adhesive and apply the dry tissue paper directly. Tissue paper can make the surface look more even. e) Place skeleton leaves around the pencil holder and cover them with tissue paper. f) Dry and press leaves and cover them with natural tissue paper. Red Maple or Acer leaves will show through and look beautiful. Check that all of the paper is well stuck to the pencil holder. If you find any loose pieces, apply more adhesive. You might like to brush on a final layer of adhesive all over the pencil holder just to be sure. Let it dry thoroughly. Apply a coat of beeswax polish to the paper vessel. Let it dry and then buff it with a soft cloth to make the vessel shine (photo 12). Repeat the procedure a couple of times. I found that the types of beeswax that have turpentine work better with paper vessels. If you decide to use this type of polish, work in a well ventilated area and be careful as turpentine is flammable. Next time you may like to work on two or three pencil holders at once. This way you can work on one piece whilst another one is drying. *If you don’t use packing tape yourself and therefore don’t have the empty inner rings, you may have a friend who sells items on Ebay and who would be happy to save the empty packing tapes for you. Please note that inner tubes of kitchen paper and toilet rolls are not suitable, as they are too weak, and it may be difficult to remove all of the sticky tape from the inner rings of ordinary domestic sizes of sellotape.